With the fast pace at which technology is evolving, we are heading into a complex network of data and also into a vague future. Meanwhile, the industries around the world are attempting to get a complete face-lift by adopting some of the revolutionary technologies like Big Data, Data Mining and Machine Learning. Now the question arises why every business around the world is eager to adopt these technologies, what is the basic concept and how do they differ from each other? Let’s find out. Why do we need technologies like Big Data, Data Mining and Machine Learning? The growing demand of data and increasing competition are forcing each company to implement these technologies into their services as they empower every business with the ability to forecast. Our lives are in the gradual process of transformation from natural beings to machine-oriented beings. As our existence has taken a digital turn, meanwhile making us addicted to technology, it is rather impossible to take a U-turn at this point of time. With the ability to record everything from your credit card transaction details to monitoring your activities via CCTV’s, hiding from this digital world seems impractical now. For businesses, most of the financial and operating data are stored in some kinds of ERP’s. In the meantime, escalation of wearable devices is digitizing our every heartbeat and breath and converting them into usable data. Now every platform is on the verge of digitization and therefore if a computer claims to understand you more than yourself, don’t be shocked. Your smartphone knows about your working hours, sleeping pattern, timings of your office and your vacation plans based on your bookings. Since, they are accustomed to your regular patterns, it is easy to predict your next move and possibly your future. Similarly, in business, machines can analyze their customer’s habits and trending behavior based on the available data and a common pattern. Hence, using these data to predict the future of business is making Big Data, Data Mining and Machine Learning a big hit. Now imagine a situation, when your vehicle is informing you that it’s time to get a car-wash or you are receiving a discount coupon at that time of the year, when you regularly go for vacation. For businesses, it is essential to get a sales forecast to determine the future and growth of the company. As the future becomes predictable, we can always plan in advance and prepare for our next move. But, what exactly are Big Data, Data Mining, and Machine Learning? A single machine can manage limited data based on its capability. Currently, the data is accumulating at a massive rate, making way for supercomputers that can deal with larger amount of data with ease. But for a Windows system, any data or file more than 10 GB would crash its entire system. Big Data has been developed to solve this problem. Reimagine this technology as a special software that can split a large file into smaller ones, so that they can be processed with ease on several machines. The method of dividing and combining of data pieces is termed as MapReduce and the software framework used for this procedure is known as Hadoop. Know More: How Big Data Is Transforming Artificial Intelligence? Hadoop is responsible for solving these basic problems with the help of some tools such as Zookeeper, Pig and Hive. Hadoop along with its related tools is usually denoted as “Big Data Technology”. With Big Data, we understand how to process a piece of information by using certain software framework. Now, coming to Machine Learning, which uses Algorithm to determine certain factors. For instance, imagine that processed piece of information contains data about a group of customer’s purchasing behaviors. Any statistical analysis about them allows us to predict the pattern of buying at basic level. Now, if the aim is to examine the correlation between different types of shoppers or you want to generalize a habit of a specific customer or to predict any customer’s gender or age, you will need a more complicated model known as Algorithm. It allows you to understand and use Machine Learning in detail, thanks to the algorithms developed for Data Mining purposes such as logistic regression, collaborative filtering, decision tree, and much more. With the help of Machine Learning algorithms, current data can be used for forecasting and therefore Data Mining is closely connected to Machine Learning. The forte of any Machine Learning algorithm hinges heavily on the supply of huge datasets. Always remember that irrespective of how cutting-edge an algorithm is, no stimulating forecast can be made from limited lines of data. 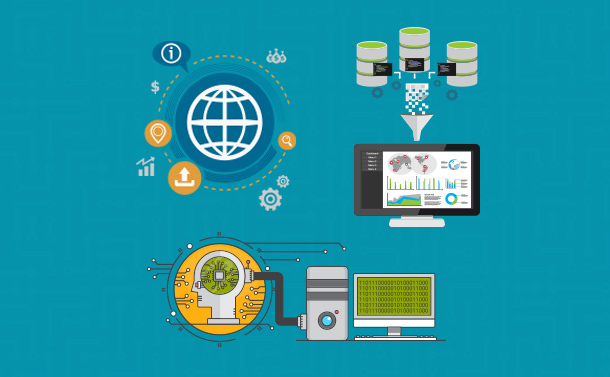 Big Data technology is the foundation of Machine Learning and with the help of Machine Learning, one can gain beneficial insights from existing datasets and this is Data Mining.